Sunni Alford, OTD, OTR/L, CHT, is an assistant professor who specializes in upper extremity rehabilitation and has been certified by the Hand Therapy Certification Committee to practice as a Certified Hand Therapist. Alford received her bachelor's and post-professional doctorate degree from the University of Kansas in 1990. 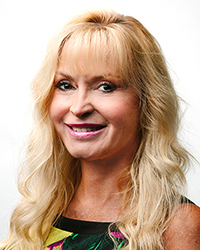 She has held positions as the director of occupational therapy for National Healthcare in Panama City, Florida, the director of rehabilitation for Delta Rehabilitation Centers in Destin and Panama City, Florida, outpatient team leader at HealthSouth Emerald Coast Rehab Center in Panama City, Florida, and site coordinator for Select Physical Therapy in Olathe, Kansas. She has developed several programs related to long-term care, and was an occupational therapy clinical consultant for Pinnacle Rehabilitation in Florida. In 2002, Alford was awarded a 14 week Upper Extremity Fellowship through Texas Woman's University. Alford has presented at the local and national level. She is a member of the American Occupational Therapy Association, American Society of Hand Therapists, Kansas City Hand Rehabilitation Special Interest Group, and Golden Key International Honor Society.